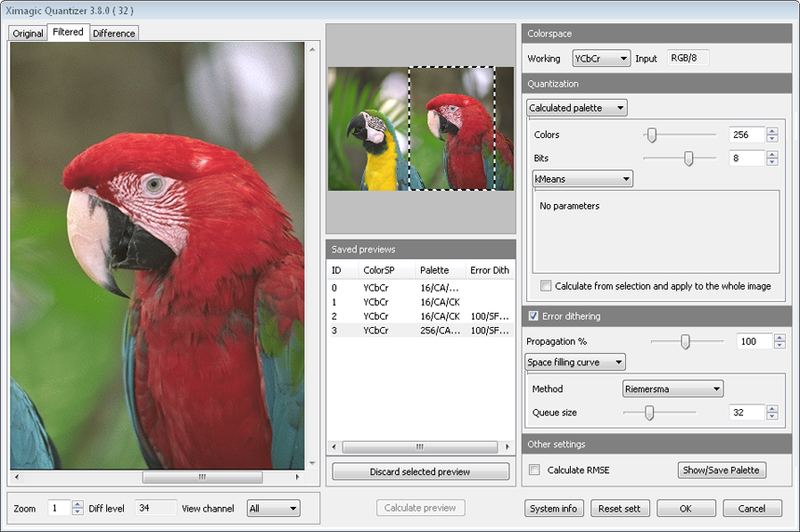 This plugin allows color reduction of RGB Color images. DifferenceThis preview shows whether the denoising is removing only noise or also some information from the image. Less visible "ghost image" in the equalized error means better denoise. When the equalized noise shows a grid it is because the image was stored using jpeg format. Colors: can be from 2 (1 bit) to 4096 (12 bits) when colors are changed, bits are updated accordingly. Bits: can be from 1 to 12. When bits are changed, number of colors area updated to match. Bits x Channel from 0 to 8. The sum of three values could not be greater than 12. When each value is changed, the value of total colors and bits are updated. Significative bits from 2 to 5. This algorithm is highly dependent of this value. When the number of colors is less so must be the value. For 256 colors usually the best results are obtained with 5 bits and with 16 colors usually the best value is 3. Significative bits from 5 to 8. Usually to reduce calculation time and memory consumption, this method only uses some bits of the 8 bits per channel. Two pass The octree reduction can be done as the Octree is build, or after it is finished. With the two pass approach, the reduction is done after the Octree is finished, this gives better results but needs more memory. Sample factor from 1 to 8. To reduce calculation time the method can process only a fraction of the pixels in the image, with the value 1 it process all the pixels. SColorQ This method includes dithering, don't select error dithering option. Filtering size 3 or 5. Greater filter size mean better results but the calculation time increases geometrically. Dithering level * 100. from 0 to > 100. Amount of dithering used. It is a % value but can be greater than 100. When the value is 0 the level is selected automatically. 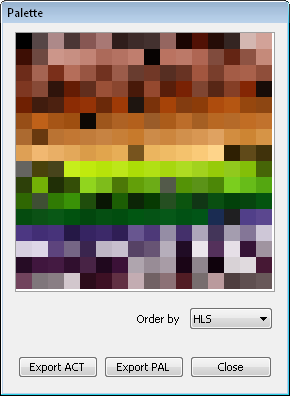 Custom palettes can be loaded from files with the appropriate format. After a pattern is loaded it remain stored until the user deletes it. To use custom palettes, select "Custom palette" in the Quantization settings.